A few weeks ago I visited on of my oldest friends. I have known this particular friend my entire life. She is the person I spent most of my social time with during my teenage years. Needless to say even if we’ve not seen each other for a while we still feel very comfortable around each other. So much so, that neither of us feel the need to go into that massive cleaning because “company” is coming over drill. When my friend opened the door to her home and invited me in I was not at all shocked by what I saw. Her place was a mess! But I had to laugh, because at that every moment my place was a mess also. Then I started thinking of my other girlfriends and realized most of their places were a mess too. This lack of housekeeping skills is one characteristic we share that is not a good one. Now don’t misunderstand. None of us have dirty homes. I would happily eat any food they prepared in their homes without a second thought. As they have eaten in mine. The kind of mess I’m talking about is Junk. Just stuff everywhere. Things that need to be put away but there has not been time to do it. Things that have taken up permanent residence on the couch or on the kitchen table that clearly do not belong there. Not long after visiting my childhood friend I was texting with one of my friends from college. She felt not being able to get rid of the clutter in her home was an obstacle keeping her from pursuing some other goals. This clutter was definitely impacting her quality of life and definitely steeling some of her Joy. I have to admit it too. This messy house has definitely been an obstacle that has been in the way since I started Chasing Joy. Never feeling like I can just invite people over on a whim is in the way. My mom helps me with my cleaning. I even took up housework as my own personal sacrifice for Lent. Yet, more often then not my house is way to messy for guests. Have a place for everything that way when you clean up you know where everything is supposed to go. This is my biggest issue I have more stuff than places for the stuff. Get rid of some of your stuff. Most of us have clothes we don’t wear, DVDs we don’t watch, and books we won’t or have already read. Get rid of some of it. Having less stuff will make it easier to find a place for it. My friend’s favorite tip is to establish a launch pad. The launch pad is a place for your purse, keys, cell phone, and any other things that you take with you every time you leave the house. Have a special place for them, the launch pad, instead of leaving them in random places. This tip should also save you time since you won’t be looking for these items on your way out the door. Get rid of something when you buy something new. I surely don’t have an infinite amount of space in my house and I bet you don’t either. So let’s stop acting like we do and get rid of old stuff as we take on new stuff. (you can get rid of some of your old work clothes and accessories at The Joy of Giving, Chasing Joy Charity Event this October). Make sure your kids and spouse know where things belong. I’m sure knowing won’t actually make them put things away but maybe they will 20% of the time, OK, 10% of the time, I think? Every time you leave a room, look around for things that don’t belong in the room and take them out with you. This can keep things from piling up too much. 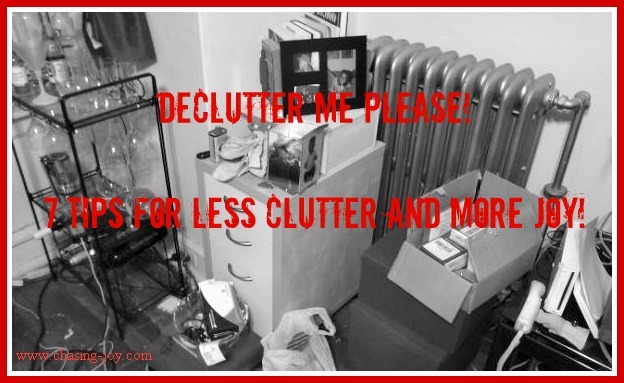 Like I said, these are all tips that I NEED TO EMBRACE What tips can you offer to help me and my friends clear out the clutter to make more room for Joy? These are some good ideas! I will be using them all and forcing them on the family. Since you asked for other tips,I would add, put it away now. Do not allow the I'll put it away later thing. Later never comes and the pile just grows.